A man riding in a stolen car was killed in a crash in Lakeside early Sunday morning, police said. 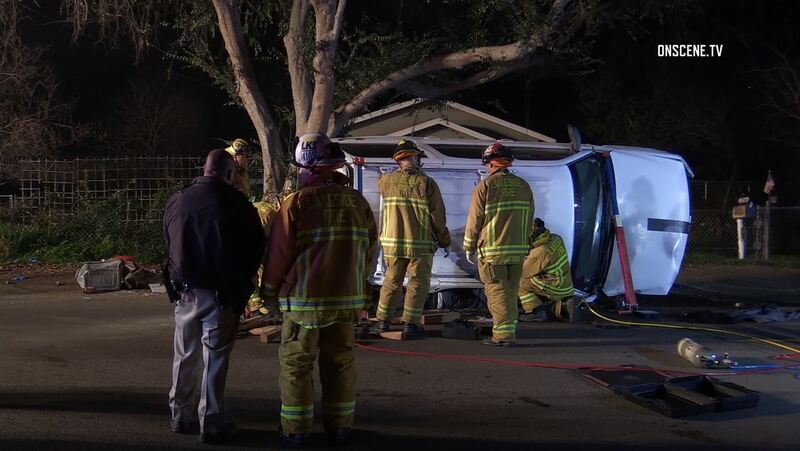 Someone called California Highway Patrol dispatchers just after 4 a.m. to report hearing a traffic collision near the intersection of Moreno and San Vicente avenues. Officers arriving at the scene found that a 2003 Chevrolet Tahoe reported stolen in September had overturned onto its side, pinning a partially ejected occupant underneath, CHP Officer Travis Garrow said. Firefighters were able to extract the person, a 27-year-old man, but he was pronounced dead at the scene due to his injuries, Garrow said. Officers believe the Tahoe was heading north on Moreno Avenue before traveling out of control into the oncoming lane and impacting a tree near the road edge. The man killed in the crash apparently was not restrained at the time. Garrow said because the victim was partially ejected, investigators can’t yet say for certain whether he was the only person in the car. San Diego County Sheriff’s Lt. Karla Menzies said the CHP initially requested sheriff’s dog units for assistance in tracking, but had no further information. The CHP does not believe drugs or alcohol were factors in the crash, Garrow said. Updated Jan. 27, 2019 at 3:25 p.m.